In an attempt to experiment with ways of talking about Russian cinema I’ve decided to add a new feature to this blog, wherein I will record a discussion of a film with a friend and post a link to it here. Click the play button above to listen to our first try at this format on your computer. 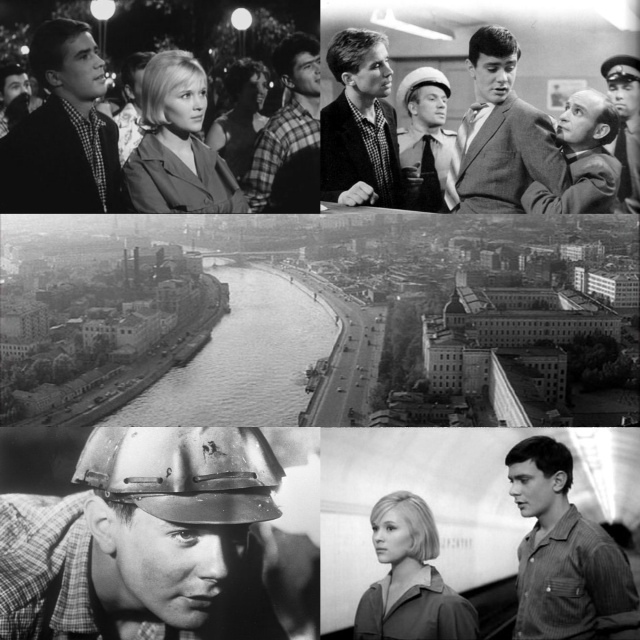 Here Derek and I discuss a 1963 film I Walk Around Moscow (“Я шагаю по Москве”). Below is a link that allows you to download the discussion as a file, and also a link to the film with English subtitles on YouTube. I hope you won’t judge our pilot too harshly, and feel free to join the discussion in the comments! Interactivity is the way forward! Thanks guys! An interesting discussion. Especially like the way you put the film in context for a teenager just getting into Russian cinema. I really enjoyed listening to this. I would have liked to hear more about the context of production. 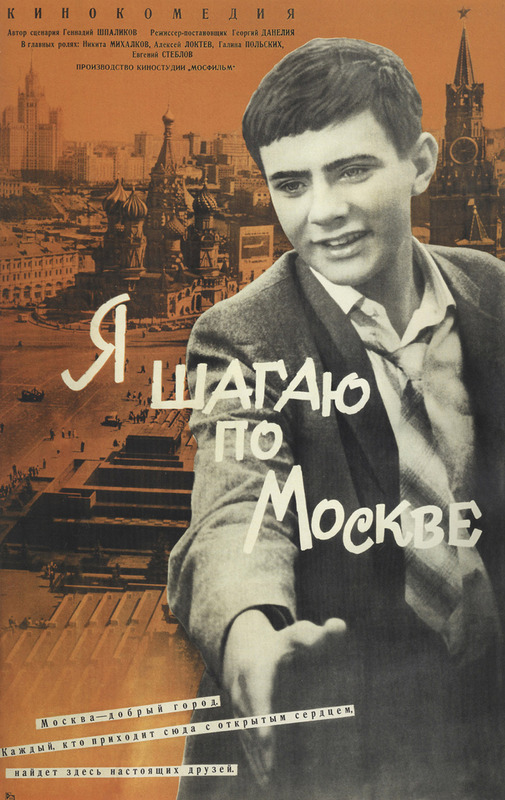 It was produced at the same time that movements such as village prose were popular and I’m interested in the very positive portrayal of Moscow. I’ve seen various accounts of the film where it is described on one hand is propagandistic and on the other as purely propaganda. I’ve also heard that certain scenes were censored. I’m very curious about the relationship between this film as “quintessentially thaw” in form, but politically benign in content. Any thoughts? Correction: On hand it was propaganda, and on the other it was not. In terms of context, you’re right it’s very interesting, and also rather complicated to explain, especially in terms of the dichotomy of ‘propaganda’ and ‘no propaganda’, as things were (as they tend to be generally :)) more complex than that. But if I were to boil it down, I would say that the liberalisation of Thaw period gave a lot of young artists a sense of freedom, a sense of hope, and even an illusion (however brief) that the state ideology can be concurrent with their artistic activities, values and so on. Hence such a revival of the 1920’s Soviet art and aesthetic during this period, but also the ideas of the purity of the 1917 Revolution and its intentions. Stalinism was denounced by the State as it was denounced by the new generation of artists. Leninism was brought back by the state and it fitted nicely with the young artist’s leftist ideals (as we know, young artists tend to have leftist ideals, we only have to look at the Western counterparts of the Soviet artists during the period). And keep in mind, that I am basically generalising a huge group of people here, a whole social class even, and there was plenty of variation, complexity and nunace in their political attitudes. You mention the village prose, and it actually becomes an important cultural force as these political developments unfold all the way into the 1970’s. Solzhenitsyn’s ‘Matryona’s House’ was written in 1963, and became a kind of blueprint for the genre that flourished during the Brezhnev years, and was absolutely one of the forms that the oppositional culture took place. Not least in the way it attributed virtue to the rural, authentic Russia and contrasted it to the evils of the industrialised might of the Soviet city. Thank you for a very interesting discussion, I found it particularly helpful as I am studying this for a Russian film module!